The Free 3D Tetris Cube for PowerPoint a 6 steps diagram presentation of cube puzzle. It shows the set of blocks assembled according to a specific plan. The 3D puzzle diagram demonstrates a link between these blocks. The 3D Tetris is a fully editable template of flat vector graphics. It allows the users to customize the range of design options like the color, size, shade etc. They can also format the background of a diagram by adding a color fill, gradient, pattern, or picture. 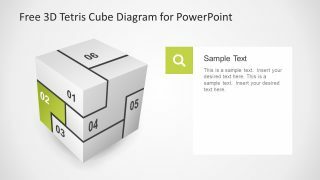 Apart from these simple changes, PowerPoint enables users to add special shape effects like 3D rotation, reflection, and shadow. 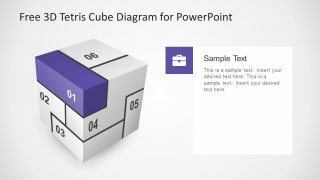 The free PowerPoint template contains four slides of 3D Tetris diagram. In this presentation, the first slide is a preview of the topic under discussion. Whereas, the next three slides display the details-layout design for the first three segments. 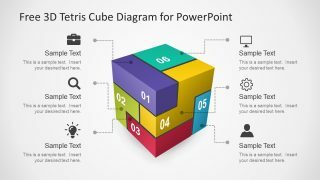 SlideModel.com has the 3D Tetris cube template with all 6 additional slides available to premium subscription users. The Free 3D Tetris Cube for PowerPoint shows the six, non-sequential blocks distinguishable by colors. However, the additional three slides gray out the 5 segments to highlight one at a time. These blocks can help present multiple options under one agenda topic. For example, the different channels to market a product, or, suggestions on how to improve the overall performance of a company. Similarly, outline a strategic plan to complete a task in 6 steps of Tetris cube. 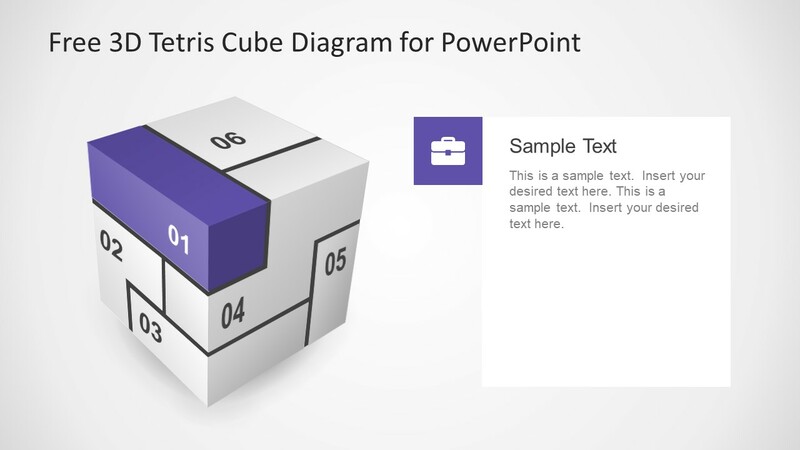 The 6 steps Tetris Cube diagram also contains clipart icons to represent each segment in the PowerPoint template. These clipart icons are most commonly used shapes aiding users to discuss various topics. And, the text placeholders give the option to add title along with the description of each step. 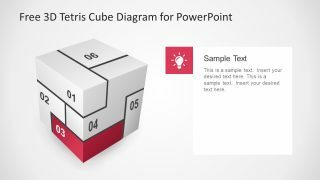 The free slides of 3D Tetris cube assist users to simply add the keywords and relevant data into the pre-design presentation. The high-resolution graphics can bring maximum audience engagement to the presentation. 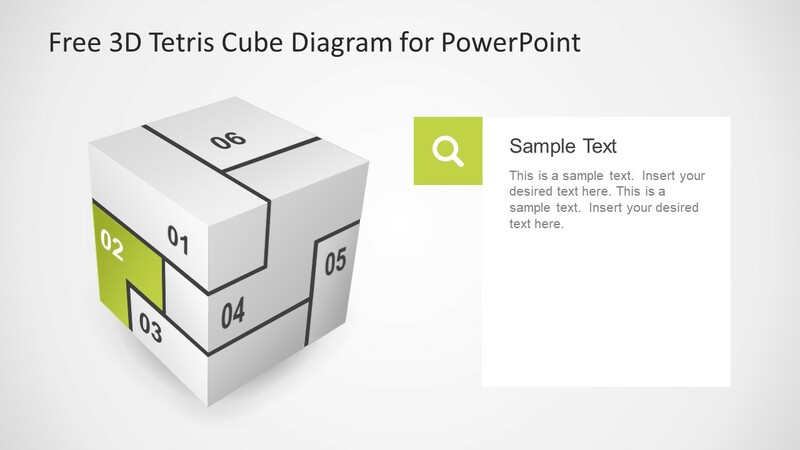 While the visual elements of PowerPoint aid in keeping the content fresh in their mind.